View the Brochure for this campaign here. 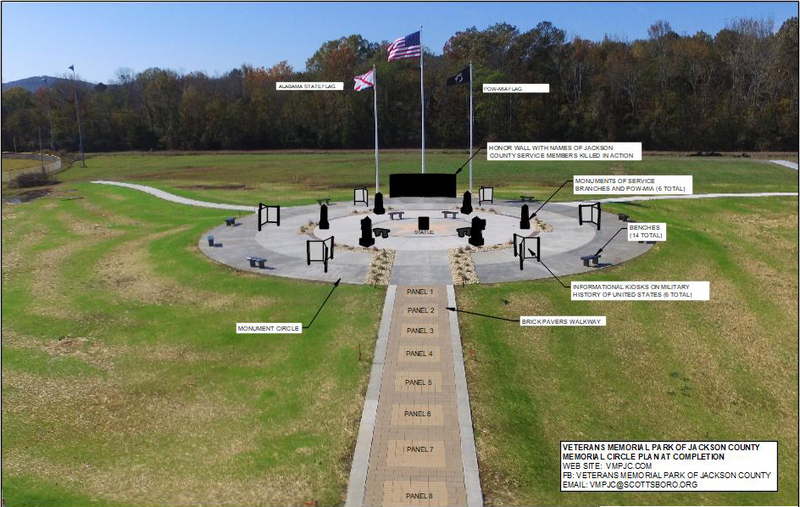 The VMPJC is undertaking a special fundraising campaign to complete the Veterans Memorial Park of Jackson County. The goal is to raise $250,000 by June 1, 2019 to complete the Park by Veterans Day, Nov 11,2019. The Veterans Memorial Park of Jackson County, Inc was formed as an IRS 501(c)(3) non­profit Corporation in 2015 for the purpose of constructing a park to 1) honor the memory of veterans from Jackson County, many of whom paid the supreme sacrifice in the defense of freedom; 2) recognize and honor those who served and are serving in our nation’s military; and 3) promote patriotism and knowledge of U.S. military history in our schools. The Park Board is comprised of members of local Veterans of Foreign Wars Post 6073 and American Legion Post 30 and other public and local organizations’ officials. All park construction up to this point has been funded with donations from volunteer labor, cash, construction services, equipment use and materials. To date, the value of installed work is approximately $250,000. Phase 1 to prepare the park for the monuments is essentially complete as shown on the attached aerial photograph. Our next phase is the purchase and installation of the black granite monuments and informational kiosks, followed by completion of the balance of phase 1 work (including pavilion) and a center statue. The estimated cost of this remaining work is $250,000. The attached modified photo shows the central features of Monument Circle. There will be an Honor Wall with the names of Jackson County service members killed-in-action, 5 black granite monuments, one for each branch of the Armed Forces, and a monument for POW-MIA. Additionally, there will be 6 informational kiosks, each containing 6 “pages” on United States military history (i.e. history of branches of service, information on wars, service academies, etc.). A covered pavilion with bathrooms will offer convenience for school and other groups to visit the park. Donations can be made to Veterans Memorial Park of Jackson County, Inc and mailed to 1616 Heroes Drive, Scottsboro, AL 35768. If you need additional information, please call Larry Becker, Board President at 256-656-9824 or email: larrybecker1944@gmail.com. In addition to unrestricted donation, special donations for the items below can be specified. Veterans Memorial Park of Jackson County © 2018. All rights reserved.